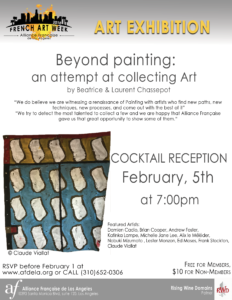 Opening the second edition of our yearly French Art Week, Alliance Française de Los Angeles is hosting a new Art Exhibition thanks to Beatrice and Laurent Chassepot. Proud owners of multiple art works, they will discuss their attempt at collecting art that goes beyond painting. “We do believe we are witnessing a renaissance of Painting with artists who find new paths, new techniques, new processes, and come out with the best of it” say the Chassepots, Laurent and Beatrice, “We try to detect the most talented to collect a few and we are happy that Alliance Française gave us that great opportunity to show some of them: LA artists Frank Stockton, Brian Cooper and French Damien Cadio find new paths to bias the ordinary technique and ordinary topics; LA artist Lester Monzon mixes genres by showing on the same canvas a battle between expressionism and abstract; French artist Alix le Méléder has reached radicalism to its most, Korean-American artist Michelle Jane Lee plays with minimalism; Dutch artist Katinka Lampe has no fear to revisit Dutch art of portraiture, as well as LA artist Andrew Foster, and Nobuki Mizumoto from Tokyo. French artist Claude Viallat has dropped altogether support, frame and topic, in order to focus exclusively on color and paint; LA artist, Ed Moses pushes the limit of painting with an endless magnificent renewal. RSVP before February 1st at admin@afdela.org or registration online. Complimentary wine (partner: Rising Wine Domains) and cheese after the talk.